I am always looking for new avenues to make extra money. These are basswoods rounds that I wood burned. I believe I can do the same things to older violins I find on ebay. I have looked at the vso's but most are plywood made and really hard to burn. Spruce and maple woods are more giving. On most violins I would want them brought into a playable condition if possible, but all this can get a bit expensive and my budget is always tight. The question I have, would it be worth the time and cost to pursue this endeavor? All responses, positive or negative, would be appreciated. A few years ago I purchased an arch top guitar that had the image of a famous jazz guitarist photographically etched into the spruce top. I think that I got the guitar cheap as a result of it but it was really well done. I will take a photo of it tomorrow for you. One of the few odors I cannot stand is from wood burning with an electric “pencil.” Totally different from a fireplace. Thanks Irv. 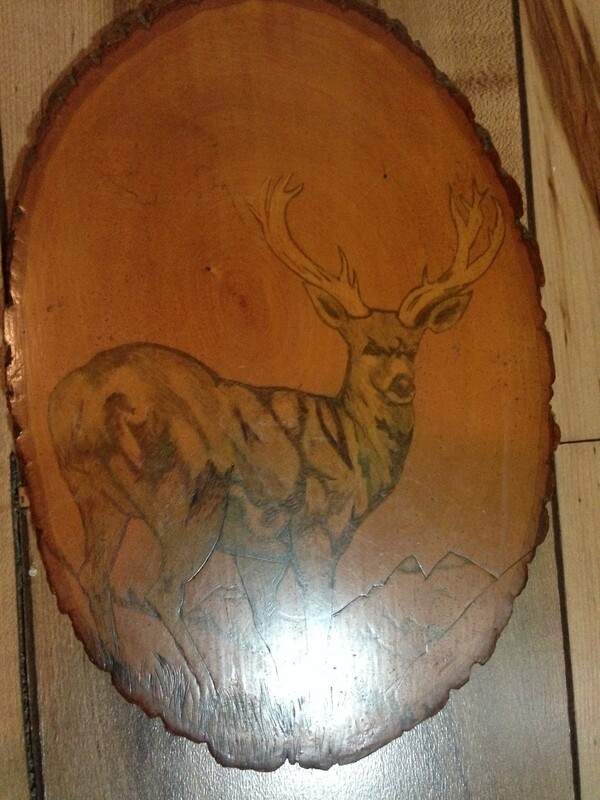 I have been a welder breathing in toxic fumes most of my life so the woodburning is actually a nice change. The worst part of burning a wood that has been previously finished is that you can never really get all the chemicals sanded out, especially on a wood so thin. The deer in the above picture is one of my drawings. I do better with bears and lions and such, but these two were available to show. I found a fiddle in an attic several years ago that was beyond repair and I thought what a shame it was that it's existence was ended so poorly. Everything has a purpose and to me, hell is not a place of fire, hell is a life of unfulfilled potential, even for a violin. Hello markcobb and others. 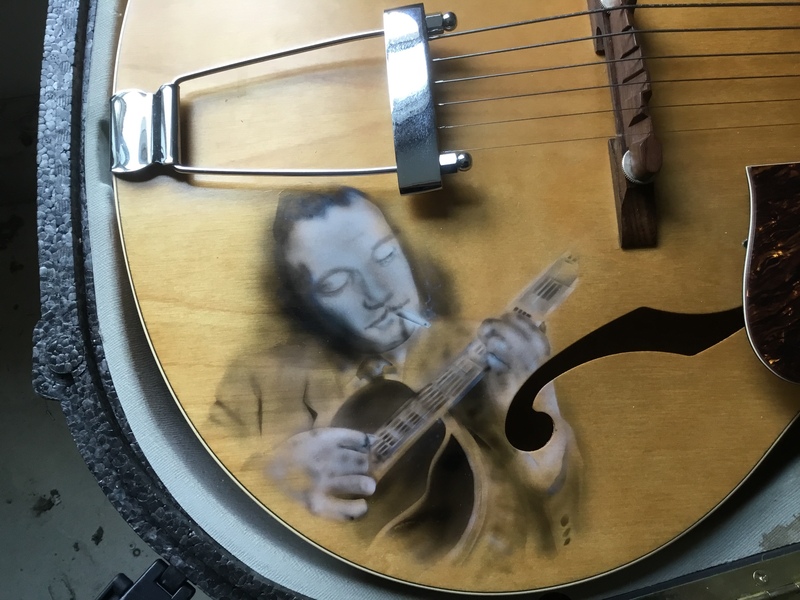 I found the arch top guitar and took a photo of the art work. On second look, it appears to be air sprayed. I think that a similar effect with a child’s portrait or a religious image would have a market. As far as removing finish, you may want to try the use of baking soda as a sand blast media. The apparatus can be fabricated from a soda bottle and an inexpensive compressed air duster ($4 at Harbor Freight or similar). I purchased a beater violin for a proof of concept test, then grew fond of the violin. I have tried the method for furniture refinishing and it worked great. Not musically related but may be of interest. Look up YouTube video on low cost hydroforming. I plan to make use of this technique to make metal bow front assembly, similar to second picture. That did not work. First picture attempt #2. @Irv that makes no sense. The price should have gone up on that guitar, not down. That is a beautiful piece of work. and the bow with the metal tip, I would want something like that. I will try the baking soda when I can get to it. I've been watching Jon Mangum build his oak and scrap wood violins to get a feel of the finish work. He does really well. When the time comes that I can focus on smaller projects, I would love to start refurbishing antique violins, but it seems like everything involving the violin is in direct contradiction to traditional thought of the workings of everything else. Special violin glue, special violin varnish, if precision is off by a fraction, you either completely change the sound or destroyed the piece. Peaceful relaxation is always the key. It is amazing that guys were able to create such masterpieces centuries ago. 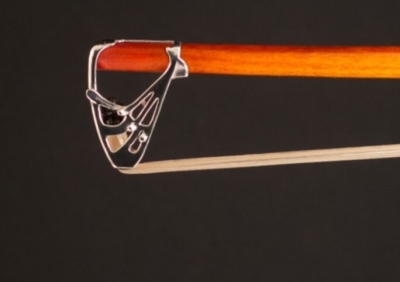 Complete respect for those that are building violins and bows. Just my opinion, compared to Giuseppe Guarneri, Leonardo da Vinci was a bit over rated. The major fault I find with oriental violins is that they devote no attention to potential benefits of innovation. Examples. I see no reason for a scroll on any violin 1/2 size or less, as it would save weight and that is a premium for a young player. 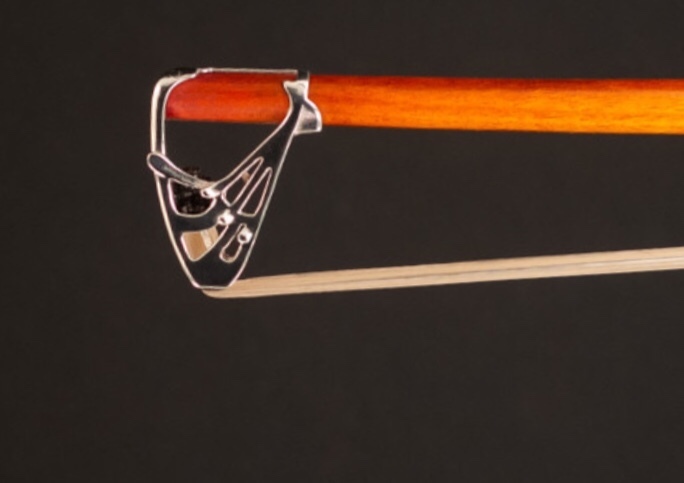 Violins of those sizes would benefit from a Flesch type chin rest since it would place the jaw on the centerline and lessen necessary arm distance for bow. A leather shoulder rest attached by securing to the chin rest and with rubber bands seems a perfect solution for young players. A set of planetary geared pegs and synthetic strings would greatly enhance the sound at minimal cost if they were locally sourced. A single carbon bow with good (say black) horse hair would cost about the same as two useless wooden bows. Hide glue loses adhesion when heated (as in a car trunk in the summer). I strongly believe that any face crack from humidity change is due to too strong a glue bond between the plates and the ribs (I would rather see the joint fail than a wood crack). I read about a luthier using a sheet of newspaper as a point of failure between the plates and the sides. This makes sense to me and might eliminate the need for purfling. Titebond wood glue also makes sense to me. Just a thought Mark. Imagine if you did customer image for people on their instruments. I for one would probably hire someone to burn an image of our sailing vessel on a fiddle of violin..... Do you get the gist? I have done custom tattoos for people like that, Paintings, airbrush harleys and classic cars, even done my brother's tombstone with his lowrider. Fresh wood would be perfect, wouldn't even need the whole violin, just the area that was to be burned. Unfinished back, front, even the neck. When the thickness of wood is known, as in I can put it in my hands and feel it, smell it, see the flow of the grain, I can etch and stain, which gives a three dimensional effect. Like scrimshaw. I like a combination of etching and burning, you can feel the print and the shading takes it another place. I used to build model boats growing up, fascinated by the idea of adventure. Burn the the image of a sailing vessel? I can put you on that sailing vessel playing Ode to Joy. Doing customer request like that, would be a dream come true. Maybe even a side income for you if you want. Thinking some old sailing vessel for the moment. I'll talk to the boss later and see what she thinks I should have etched. Shane. How much force do you use to press against the wood while you burn an image? I can’t imagine that it would be much. If otherwise, I devised a procedure of inserting a small Mylar balloon through the f hole and blowing it up using a plastic straw coming through the dislodged end peg. A single “letter” i or l Mylar balloon $1 on eBay is adequate. The balloon has a self contained duck bill check valve so it keeps the inflation pressure very well. The balloon can be deflated by either forcing the straw further in the balloon, or by using a sharp knife to pierce the balloon through the f hole. I looked at yinfente last night, don't know much about them except they are extremely proud of their unfinished violins. Some cost as much as their finished violins. They have a 6 string violin, kinda like bigfoot, I've heard of them but thought that it was just a joke. I used to be married too. Still have nightmares. @Irv none at all. It's all about patience and timing. With a low heat you can burn lines but it's like watching paint dry. Best for shading. With a high heat you can move on pretty good. If you sit in one spot to long, it burns out away from the pattern and you have bulges in the line, and the high heat will actually cut into the wood if you go to slow. To fast and the line will fade when you coat it. Same as tattooing really. You wear gloves to keep your oil off of the wood, which affects the finish, in tattooing it causes infections. You have to have your speed right and pressure light to keep from going to deep. Tattooing it's 1/64 of an inch ( the second layer of the epidermis) and to keep from cutting the skin. And you have to be able to draw and write in reverse of what you see in order to make patterns. Unless you have a light table for tracing or hectograph stencil maker. That's for amateurs and lazy people. The picture comes alive in the first pattern and then you reduce it to lines only, and add the shading into the final pass of the burning process. It's easy if you're patient. In tattooing you test people by their ability to draw a circle free hand with their eyes closed. Because when you're using ink, you can't see where the line is going. It's not hard with lots of practice, but that takes patience also. It's all about commitment to practice. LOL. I don't have nightmares though. We are like best friends. I like to joke and say that I'll talk to the boss but she talks to me about all her decisions as well. We've been together for about 35 years. Still happily married. I think the trick is to never give up, have hobbies together and lots of love rather than criticism 🙂 When you give or yourself, it often comes back to you. Can you trace something in advance and tattoo over it? @Fiddlerman I have seen pictures of your wife and bow to your masculinity and prowess. The second warthog I was married to layed on my Italian loveseat (yes I loved it, It was my first major I am now an adult purchase), so long it looked like the smiling face on a happy meal box. I like amazon but I don't want furniture shaped like their logo either. After she killed the Lazyboy I knew the marriage was over, I was running out of furniture. Coverups depend a lot on the current condition of the tattoo. If it's fresh and really dark, then the cover design incorporates and camouflages the original tattoo, breaking up the design and the lines until it disappears. If it is an older tattoo, especially if the black ink has turned green or blue, you can cover it up with just about anything. Inks have come a long way in the past 30 years. Voodoo ink has a an outliner ink that when mixed with calcutta black shading ink, dominates most outlines because it is so black. With the stronger inks around today and the advent of cosmetic dyes, you can nearly make any tattoo disappear within reason. Dependant on size, spreading of the old inks on and on. Bigger decisions for one to consider is do I want a tattoo at all, do I want a better tattoo, do I want fix the one I have? Laser removal, from what I understand, is not that painful. I have way to many tats to consider that or i would have the majority removed. You can cover up most anything and one of the best shops in the country is in Orlando, Hart and Huntington Tattoo shop. 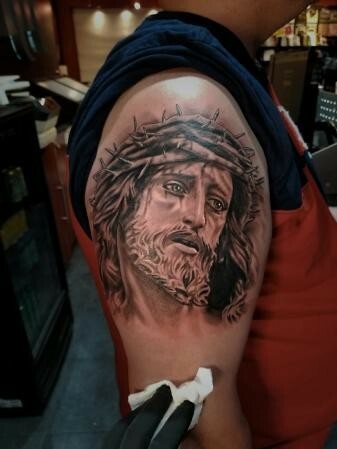 If it is a matter of the tattoo being old or faded, you can have it refinished which produces an effect that can't be duplicated in a new tattoo. Many have tried, but it's the way the old Ink blends to the new ink in the skin. This is one of the Hart and Huntington shop tats to give you an idea of what's possible. 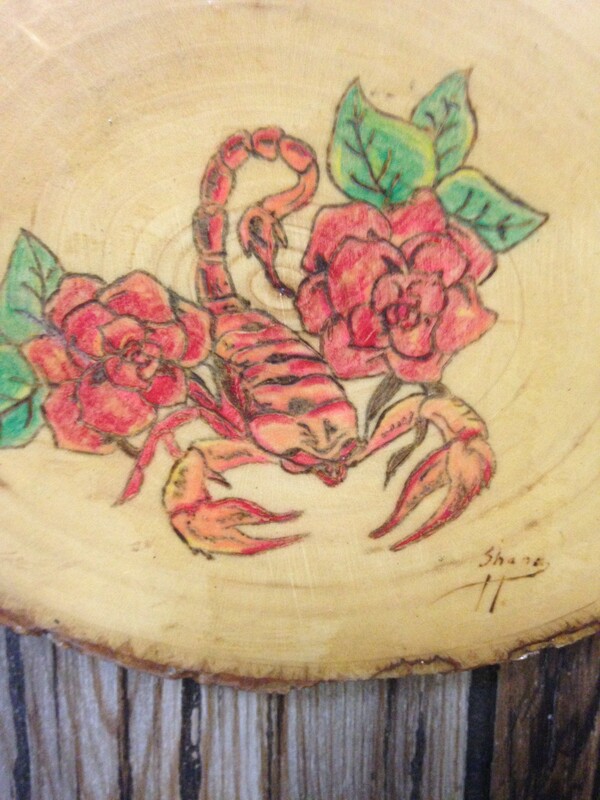 Yeah, I used to do work like this on people, I can still do stuff like this on wood.